Patrick Lynch, MD, is the Medical Director at Carolinas HealthCare System Harrisburg. He had previously served as Assistant Director and Quality Director at Carolinas HealthCare System Lincoln in Lincolnton, NC. Dr. Lynch received his medical degree from Northeastern Ohio Universities College of Medicine in Rootstown, OH. 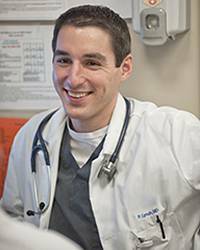 He completed his emergency medicine residency at The University of Rochester School of Medicine and Dentistry/Strong Memorial Hospital in Rochester, NY. Outside of the ED, Dr. Lynch’s interests include skiing, golfing and traveling with his wife Jessica. He also enjoys relaxing while watching movies or reading.